An Annuity is a retirement income planning vehicle that will give you lifetime income and safety for the rest of your life. It is a contract between you and an insurance company, where you make either a lump-sum payment or a series of payments. You can enjoy tax-deferred interest growth on an annuity, without having to pay taxes on the interest until you actually start taking your distribution payments. An annuity has been mainly used as a guaranteed income stream when you reach retirement – which we call the distribution phase of your lifetime. However, many people are now also using an annuity for growth during the accumulation phase of their lifetime, because they can participate in the gains of the stock market with no risk to principal. A Fixed Index Annuity also known as a “hybrid annuity” is tied to a common market index, such as the S&P 500, Dow Jones, or Russell 2000 and many more. Your annuity earns gains when the index rises and is performing well. And even if the index declines in value, your account is protected and cannot lose value. This is what makes a fixed index annuity the preferred financial vehicle for securing retirement. You can enjoy the gains of the stock market without the market risk and no risk to your principal. The insurance company that issues your annuity will assume the market risk, and will provide a return when the index linked to your contract is positive. The gains you earn on your annuity are ‘locked in’ every year, and your account value can never decrease. Your principal is guaranteed to grow at a pre-determined rate in case the stock market has a down year and does not perform well. Annuity rates on fixed index annuities are usually substantially higher over fixed rate annuity returns and other retirement financial vehicles. Many Benefits Of Fixed Rate Annuities — Including guaranteed lifetime income, Substantial and Solid Returns and Inheritance Options. Market Linked Gains — Linked to a stock market index, like the S&P 500, Dow Jones, etc., you have the potential for higher returns. These annuity return rates outperform CDs and debt-based vehicles like bonds in the long-term. Protection of Principal — Your account will never lose value no matter how much the market drops in a given year. Guaranteed Rate — A minimum guaranteed fixed interest rate provides protection of your money in the event of consistent market losses. Power of Tax Deferral — Pay nothing on interest earned until you start taking withdrawals. Estate Planning — Avoid the delay and cost of probate with direct payment to your designated beneficiary(ies). During the accumulation period of a Deferred Fixed Index Annuity, the rate of return on your account depends on the market index you choose. Although the value of any index varies from day to day and isn’t predictable, the insurance company guarantees the value of your annuity will not decrease as long as you do not withdraw the money. 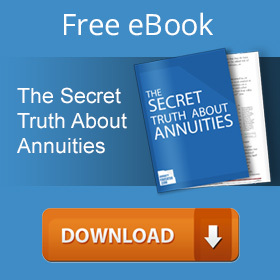 How Are Fixed Indexed Annuities Different From Fixed Annuities? A Fixed Indexed Annuity is different from Fixed Annuities. 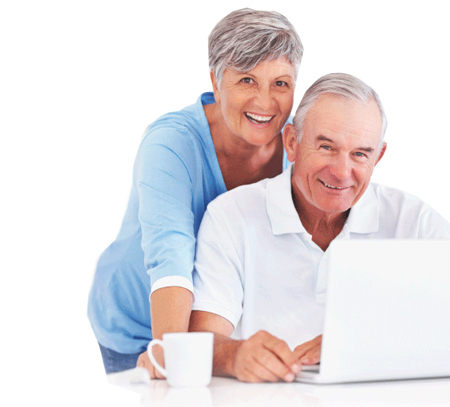 Fixed rate Annuities credit a fixed rate of interest, which the insurance company guarantees. Indexed Annuities credit interest using a formula based on changes in the performance of an equity, bond or commodity index. This formula determines how the interest, if any, is calculated and credited to your Annuity’s account value. The features of your particular Fixed Indexed Annuity will define the amount of interest you receive and when it is applied. An Indexed Annuity also offers a guarantee. A declared minimum interest rate will be credited on part of your initial premium if you decide to surrender the Annuity or if your Annuity linked index performs poorly. This guarantee is not credited annually. It’s important to note that if there’s a negative change in the index your Annuity is linked to, your Indexed Annuity will be credited with 0% interest, and will never be credited with a negative return. For example, some Indexed Annuities guarantee the minimum value of your Annuity will never be less than 87.5% of the premiums you’ve paid, plus at least 3% interest (less any partial withdrawals). You will never receive less than the guaranteed minimum value, even if you surrender your Annuity, withdraw the full amount and pay surrender fees. An Indexed Annuity with a minimum guaranteed surrender value of 87.5% of premiums credited with 3% interest would provide a return of 101.43% at the end of a six-year term [(87.5% x 1.03%) x 5)] and more for longer term periods. However, if you decided to surrender such an Annuity before the fifth year, you would receive less than the premiums paid for the contract. The floor is the minimum interest rate you’ll earn on an Annuity. All Indexed Annuities have a floor of 0%. Having a 0% floor protects your Annuity account value from the risk of market downturns. So even if the index decreases in value, the index-linked interest you earn will never be negative adjustment to your Annuity’s account value. What Features Affect Interest Credited To My Annuity? There are several different features on your annuity contract that you can select, that will affect your annuity’s potential to earn interest. These features are the Index, Indexing method, Index term, Participation Rate and/or cap/spread rates, and bonuses. These features have the greatest effect on the amount of interest your Indexed Annuity is credited with. It’s important to understand these features and how they work together. Indexed Annuities credit interest using a formula based on changes in the performance of an equity, bond or commodity index. The index is an external benchmark. The Annuity isn’t invested directly in the investment that’s the basis for the index. For example, if the Annuity is linked to a stock fund you aren’t buying shares of stock and dividends paid on stocks don’t increase your Annuity earnings. The company credits earnings to your Annuity based on the index you select, but guarantees the value of your Annuity won’t decrease because the index goes down. Note that the past performance of an index doesn’t indicate future results. Some Annuities may be linked to more than one index. The indexing method is the way the amount of positive change, if any, in the index is measured. Some of the most common indexing methods, which are explained more fully later on, include annual point-to-point, term end point and monthly and daily averaging. The index term is the period over which index-linked interest is calculated; the interest is credited to your Annuity at the end of a term. Terms are generally from one to ten years, with one year being the most common. Some Annuities offer a single term while others offer multiple, consecutive terms because of multiple crediting strategy options. For Flexible Premium Annuities, the payment of each premium may begin a new term for that premium. An Annuity that credits index-linked interest less often than annually may credit none of the index-linked interest, or only part of it, if you take out money before the end of the term. It’s important to understand how this will affect you if you’ll be making a full or partial withdrawal before the term ends. The company usually offers a participation rate for a specific period (from one year to the entire term.) When that period is over, the company can set a new participation rate for the next period. Some Annuities guarantee that the participation rate will never be lower than a set minimum or higher than a set maximum. It’s common for companies to offer participation rates of less than 100%, particularly when there’s no cap rate. Many Annuities may put an upper limit, or cap, on the index-linked interest rate. This is the maximum rate of interest the Annuity will earn. In the example given above, if a contract had a 6% cap rate, then 6% would be credited, not 6.3%. Some Annuities guarantee that the cap rate will never be lower than a set minimum or higher than a set maximum. It’s common for companies to use a cap rate, especially if the participation rate is 100%. In some Annuities, the index-linked interest rate is computed by subtracting a specific percentage from any calculated change in the index. This spread rate, sometimes referred to as the “margin” or “asset fee,” might be instead of, or in addition to, a cap or participation rate. In the example given above, if the calculated change in the index is 9% and the spread rate is 2.25%, the credited rate would be 6.75% (9% – 2.25% = 6.75%). In this example, the company subtracts the percentage only if the change in the index is positive. Some Indexed Annuities offer a bonus. The most common type of bonus is a premium bonus. This type of bonus immediately increases the value of the Annuity and is usually credited as a percentage of the premiums paid into the contract. In some Annuities, there’s a separate charge for the premium bonus. This lets the insurance company keep the surrender charges lower, relative to other Annuities with a bonus. However, if you withdraw more than your penalty-free amount on such an Annuity, you may lose part of your premium bonus. This type of bonus is accessible to you if you decide to surrender your contract. Another type of bonus is a Guaranteed Lifetime Withdrawal Benefit (GLWB) bonus. A GLWB bonus is like a premium bonus in that it’s usually a percentage of the premiums paid into the contract. However, a GLWB bonus is different in that you can’t access the bonus if you surrender your Annuity for cash. A GLWB bonus is credited to the benefit base value, not the accumulation value. For this reason, this type of bonus is only accessible if you take lifetime income payments through your GLWB. The last type of bonus available on some Annuities is an Annuitization bonus. This type of bonus is very similar to a GLWB bonus but is only accessible if you take lifetime income payments through Annuitization. Many two-tiered Annuities offer this type of bonus. When considering bonus options, it is important to know that although, bonuses can help boost your Annuity’s account value, in general, Annuities with bonuses have higher surrender charges and the surrender charges apply longer than Annuities without bonuses. In addition, all things being equal, an Annuity with a bonus may have less potential for gains than a non-bonus Annuity. It is essential to be aware of the terms and conditions of any bonuses you’re considering. What Are The Features And Trade-Offs Of Different Indexing Methods? This chart will help you understand how each Indexing Method works. The value of the index is reviewed on each policy anniversary. The change in the index is measured this way from one year to the next. Any interest earned is credited to your Annuity each year, subject to any participation, cap or spread rates. Since the interest earned is "locked in" annually and the index value is "reset" at the end of each year, future decreases in the index won't affect the interest you've already earned. Only the beginning and end points are considered. Since potential interest is credited annually, your Annuity's participation, cap and spread rates may change each year and generally will be lower than that of other indexing methods. Any index-linked interest earned is calculated on the difference between the index value at the end of the index term and the index value at the start of the term. Index terms may range from 3 to 10 years. Potential interest is added to your Annuity at the end of the index term as opposed to each year, subject to any participation, cap or spread rates. Only the beginning and end points are considered. Since interest isn't credited until the term ends, you may not receive index-linked interest until the end of the term. There may be a lower spread rate or higher participation or cap rate than with some other indexing methods. Partial or full surrenders may not receive any index-linked interest if taken before the term ends. Any Index-linked interest is determined by recording the index's value on specific dates (every month for monthly averaging, every day the market is open for daily averaging) and comparing the average of these values with the index value at the start of the term. Potential interest is added to your annuity at the end of the year, subject to any participation, cap or spread rates. In a steady-rising market, point-to-point methods may perform better. Since potential interest is credited annually, your Annuity's participation, cap and spread rates may change each year. Most products that use this indexing method lock in interest annually and reset the index value at the end of each year. This protects interest earned from being affected by future decreases. Participation and cap rates may be higher (and any spread rates may be lower) than with other indexing methods. Similar to monthly averaging, any index-linked interest earned is determined by comparing the change in an index's value from one monthly anniversary to the next monthly anniversary. Each month, positive changes are subject to the cap rate but negative changes are not. At the end of the term, the monthly changes are added and any positive index-linked interest is credited. If the sum is negative, zero interest is credited. Contracts with this design have a lower cap rate than other designs because the cap rate is applied monthly, although interest is credited at the end of the term. Monthly decreases in the index will reduce any interest credited at the end of the term. Since this indexing method considers downward movements of the index, Annuities using this indexing method may earn higher index-linked interest than many other indexing methods in a steadily-rising market, due to cumulative increases in the index. Are There any Fees in Buying an Annuity? Annuities have fees associated to the cost of selling and management. Fees are covered by deducting them directly from the contract value, or they may be reflected in lower interest rates. There are no up-front costs when purchasing Fixed-Indexed Annuities. When adding a benefit rider to your annuity, there may be a charge based on the Annuity’s accumulation value to cover the cost of the rider. Some Indexed Annuities may also charge a fee (based on the Annuity’s accumulation value) to cover the cost of the crediting strategy used, rather than apply a cap, participation or spread rates. It is important to read the disclosure and ask your financial agent or the annuity company to disclose the costs that may apply to your Annuity. A transaction fee is a charge for each premium payment or other transaction. A percentage of premium charge is a charge deducted from each premium paid. The percentage may vary over time. Some states charge a premium tax on Annuities. The insurance company pays this tax to the state. The company may subtract the amount of the tax when you pay your premium, when you withdraw your contract value, when you start to receive income payments or when it pays a death benefit to your beneficiary. A surrender charge is usually a percentage of the premiums you’ve paid or of the value of the account when you make the withdrawal. You may pay this charge in order to take all or part of your money out at any time during your Annuity’s accumulation period. Your annuity’s contract and disclosure statement, will specify exactly the percentage of money you may withdraw without paying any fees, and when the charges will no longer apply, based on the timeframe you’ve had the annuity. Some annuities have a penalty-free withdrawal feature. This feature allows you to make one or more withdrawals without a charge. up to a total percentage of your Annuity’s accumulation value. If you make a larger withdrawal, you pay a withdrawal charge called a partial surrender charge. You may lose any interest above the minimum guaranteed rate on the amount withdrawn, and you may lose part of your principal. What Optional Benefits Can I Choose? Insurance companies offer many optional benefits that can be added to your Annuity. Some commonly offered riders are described below. Each rider will increase the cost of your Annuity. It is important to be aware of the cost associated with each rider, to determine if the rider would be beneficial to your situation. A Guaranteed Minimum Death Benefit rider guarantees the minimum amount of the death benefit the insurer will pay your beneficiary if you die before the insurer starts to make monthly payments to you. The insurer will make this payment regardless of the return on the investments in your subaccounts. For example, suppose you’ve paid $50,000 in premiums for a Variable Annuity and buy a rider that guarantees a death benefit that will be at least as much as the premiums you’ve paid. If the investments in your subaccounts have done so poorly that the contract is only worth $10,000 after five years, the rider guarantees a death benefit of at least $50,000. Some Guaranteed Minimum Death Benefit riders may also “step up” this guaranteed death benefit amount or add interest to it from time to time. Some Annuity benefits are called living benefits. These benefits all provide some guarantee for the Annuity owner – a guaranteed income from the Annuity, guaranteed withdrawal amounts, and/or guaranteed protection of the premiums you’ve paid. There’s an additional cost for each rider – and the cost can be significant. A Guaranteed Minimum Income Benefit rider guarantees a minimum return on the investments in your subaccounts. Based on this return, you’re guaranteed a minimum income. You usually must buy this rider when you buy your Annuity and must Annuitize to use the rider. For example, this rider might guarantee that your monthly payment will never be less than 75% of your first payment. If the first payment to you was $1,200, this rider guarantees that your monthly payment will never be less than $900, regardless of how the investments in your subaccounts do. You couldn’t use this rider if you took the money from your Annuity in a lump sum payment. And there may be a waiting period before you can use this rider to receive payments. A Guaranteed Minimum Accumulation Benefit rider guarantees that your Annuity will be worth a minimum amount by a set date, even if the investments in your subaccounts do poorly. For example, this rider might guarantee that your Annuity will earn at least 8% a year by the end of ten years. If at the end of ten years your Annuity has only earned 4% a year, your insurer will add the difference. A Guaranteed Minimum Withdrawal Benefit rider guarantees a return of all of the premiums you’ve paid, regardless of how the investments in your subaccounts do. You must make annual withdrawals, with each limited to a certain percentage of the premiums you’ve paid. This rider does not return the premiums you’ve paid as a lump sum payment. How does it work? For example, suppose you pay $100,000 in premiums for a Variable Annuity and buy a rider that guarantees a 6% withdrawal rate. The rider guarantees you can withdraw $6,000 (or 6% of the $100,000 you’ve paid in premiums) annually without penalty even if the investments in your subaccounts have done so poorly that your Annuity is only worth $70,000. The total amount of withdrawals is limited to the premiums you’ve paid or $100,000 in this example. A Guaranteed Lifetime Withdrawal Benefit rider protects you against losses in the investments in your subaccounts. It guarantees that you can withdraw a percentage of your original principal each year without penalty for life, regardless of how the investments in your subaccounts do. For example, suppose you pay $100,000 in premiums for a Variable Annuity and buy a rider that guarantees a 6% withdrawal rate. The rider guarantees you can withdraw $6,000 (or 6% of your original $100,000 investment) annually without penalty even if your Annuity’s account value goes to zero. The percentage you can withdraw is usually based on your age and your Annuity’s benefit base value. Most Annuities are single-tiered; the Annuity’s account value and cash values become closer together over time. In a two-tiered Annuity, the Annuitization value and the cash value are two separate and independent values. These values are calculated separately and frequently become further apart over time in a two-tiered Annuity. The cash value of a two-tiered Annuity is the amount that you can withdraw in cash. The cash value balance usually earns a minimal interest rate – one set by the insurer. The Annuitization value can only be used to buy an Immediate Annuity from the insurer at a price the company sets (there’s a stated maximum price in the contract). Generally, on a two-tiered Annuity only the Annuitization value will be credited with any bonuses and index gain that you receive. Since most Deferred Annuities are surrendered rather than Annuitized, it’s very important to understand that if you buy a two-tiered Annuity, you cannot access the Annuitization value directly as cash. If you withdraw money from the cash value, it will affect your Annuitization value and, during the surrender charge period, surrender charges will apply. How Do I Know If A Fixed Indexed Annuity Is Right For Me? The questions listed below may help you decide. You should think about what your goals are for the money you put into the Annuity. You also need to think about how much risk you’re willing to take. After I buy the Annuity, how much money do I need to have available to cover major expenses and emergencies? How much will I have for these expected expenses? If I had to surrender the Annuity, am I comfortable with the minimum guaranteed surrender value on the contract? Am I comfortable with the length of time that I’ll pay surrender charges if I withdraw money from the Annuity? How long can I leave my money in the Annuity? Does the Annuity let me get money when I need it? How soon will I need income payments? How much retirement income will I need in addition to what I’ll get elsewhere? Will I need income payments only for myself or for myself and someone else? If the Annuity loses money, will I still have enough income to meet my needs? When is the earliest I can get money out of the Annuity and how much can I get? To which index is the Annuity linked? Do I have a choice? Will I have the option in the future to change the index the Annuity is linked to? What is the minimum guaranteed surrender value? When is the indexed interest credited? Does my Annuity have an interest rate cap? What is it and how long is it guaranteed? Is there a minimum cap? Is the cap in addition to, or instead of, a spread or participation rate? Does my contract have a participation rate? What is it and how long is it guaranteed? Is there a minimum participation rate? Is the participation rate in addition to, or instead of, a spread or cap rate? Does my contract have a spread? What is it and how long is it guaranteed? Is there a maximum spread? Is the spread in addition to, or instead of, a participation rate or cap rate? If there is a bonus, when it is credited and on what amount? Is there a recapture provision or vesting schedule which could cause me to lose my bonus? Do I lose any bonus if I take a lump sum rather than Annuitize my accumulation value? Are there other ways I could lose the bonus? If I take a lump sum and surrender the Annuity, will the accumulated value or the way interest is credited change before I do this? Is this a single premium or flexible premium contract? Is there a Market Value Adjustment (MVA) feature in my Annuity? How long is the free look or right to return period? How much are the withdrawal charges, surrender charges and other penalties? How long do they apply? How much can I withdraw without paying surrender charges or losing interest? What other charges may be deducted from my premium or contract value? How much will the total charges and fees be each year? What happens to the money in my Annuity if I die? Before you decide to buy an Annuity, remember to review the contract terms and conditions, because these vary with each Annuity contract. It is also important to consider your needs depending on your age, and what you want to accomplish, to make sure that the Annuity is right for your situation. Withdrawing money from your annuity means you may have to pay taxes and/or penalties. If you’re replacing an Annuity, you may have to pay direct or indirect costs associated with the new annuity. You may also have to pay surrender charges on the old Annuity if applicable. If you’re selling another asset, are there penalties associated with the sale? Will you have to pay taxes on the sale? Annuities are intended to be a long-term product. Generally, you should keep it long enough to avoid paying any penalties. If you’re buying an Annuity to fund an IRA or other tax-deferred retirement program, there may be some additional advantages using this approach. Remember to ask your financial advisor if there any. Upon delivery of your Annuity contract, READ IT CAREFULLY!! Also, read the insurance company disclosure provided with your annuity. Ask your Financial Company for an explanation of anything you don’t understand. You want to do this before any free look period ends. Any bonuses that are included an annuity, may seem very attractive, however it is important to consider the costs and benefits associated with them. Bonuses can help boost your Annuity’s value, but it’s important to understand how they work. In general, Annuities with bonuses have higher surrender charges and the surrender charges apply longer than in Annuities without bonuses. In addition, all things being equal, an Annuity with a bonus may have less potential for gains than a non-bonus Annuity. Make sure you understand the terms and conditions of any bonuses you’re considering. A Fixed Rate Annuity gives you the stability and consistency of a fixed interest rate that is determined by the insurance company and is guaranteed never to renew below a stated minimum rate. Interest credits are usually applied daily to the Annuity Value. This type of annuity provides a predictable return and a guaranteed stream of fixed payments over the life of the Annuity. Depending on the provision of the particular Annuity, Annuity owners can make one contribution or many contributions. During the accumulation period of a Fixed Deferred Annuity, your money earns interest at rates set by the insurance company or in a way spelled out in the Annuity contract. The company guarantees that your annuity contract will never earn less than a stated minimum rate of interest. When you are ready to start the payment period, you will receive a fixed amount of income each month or year that will always stay the same amount. While Fixed Immediate Annuities may be available, this guide describes Fixed Deferred Annuities. During the accumulation period, your money earns interest. Fixed annuities rates have different rates and are dependent on several factors. The insurance company sets the interest rates, which can change. Look for the minimum guaranteed interest rate. This is the absolute lowest rate your Annuity can earn. This rate is stated in the contract. Interest on your Annuity is credited based on the current interest rate. If at any time your annuity’s minimum guaranteed interest rate is higher than the current interest rate, they will always credit your annuity with the guaranteed rate. The current interest rate when you first buy your Annuity is called the initial interest rate. Ask how long the company promises to pay this initial interest rate; in many Annuities, the initial interest rate only applies to the first year you own the Annuity. When the rate changes, it may be lower. Once the initial interest rate period ends, the company credits interest to your Annuity based on the renewal interest rate. The disclosure tells how the company will set the renewal rate and how often it can change. The renewal interest rate may be lower than the initial interest rate. As an incentive to buy and keep an Annuity, some companies offer a bonus interest rate. A bonus interest rate is higher than the current interest rate, but you must qualify and meet certain conditions in order for the insurance company to apply the bonus interest rate. For example, if you take a lump sum at maturity or take an early withdrawal, you may lose the bonus interest rate. Multiple interest rates apply to Flexible Premium Annuities. These contracts may apply different interest rates to each premium you pay. Are There any Fees Associated with My Annuity? You may take out all or part of the money in your Annuity at any time during the accumulation period but you’ll likely pay a surrender charge. The contract and the disclosure tell you how much you can take out without paying a charge and if the charge no longer applies after you’ve had the Annuity a while. The questions listed below may help you decide what the best fixed annuity might be for your particular situation. You should consider what you want to accomplish and what your goals are for the annuity. You also need to think about how much risk you’re willing to take. How much retirement income will I need in addition to what I will get elsewhere? After I buy the Annuity, how much money do I need to have available to cover major expenses and emergencies? How much would I have for these expected expenses? If the Annuity only earns the minimum guaranteed interest rate, will that be enough income to meet my needs? What is the initial interest rate and how long is it guaranteed? Does the initial rate include a bonus rate and how much is the bonus? If there’s a bonus, when is it credited and on what amount? What renewal rate is the company crediting on Annuity contracts sold last year? What happens to the money in my Annuity if I die? • How long is the free look or right to return period? Also known as Income Annuities and SPIA’s (Single Premium Immediate Annuity), generate income payments to you or a designated payee within 12 months of the issue date, hence the term Immediate. Immediate Annuities allow you to receive income distributions immediately, and are usually purchased with a single payment. Your income payment plan can be customized in a variety of ways. You can choose to receive income payments to last a lifetime, a set period of time such as 10 or 15 years, or a mixture of both. A SPIA works well for people who need income immediately. Stability – Achieve peace of mind knowing that a check will be mailed to you or deposited into your bank account on the same day of every month, just like an income paycheck. Spousal Protection – Income can be designed to last for the life of you and your loved one, just like a pension plan. Inflation Protection Options – Income can be designed to grow from 1% to 5% guaranteed each year or it can adjust automatically based on changes in the Consumer Price Index (CPI) in order to protect the spending power of your money. Cash Refund and Installment Refund Options – Ensures your money is passed to beneficiaries if you happen to pass away earlier than expected. With a Fixed Immediate Annuity, income payments begin immediately upon issue or within 1 year from the issue date. Your income payment amounts are determined by several different factors: life expectancy, gender, amount of premium used to fund the Annuity, and the payment option plan you desire. Payment options can be structured to last a lifetime, two lifetimes (joint annuity), a certain period of time or a combination of lifetime and guaranteed periods. Some insurance companies also offer Immediate Annuities with a revocable feature, which means the contract can be surrendered, and you may withdraw the funds from the account. Immediate Annuities funded with after-tax dollars create income payments comprised of both principal and interest. The principal portion of each income payment will not be taxed. Please note that these payout rates include both interest and return of principal. 1Rates are subject to change at any time. Based on a life with the installment refund option for a policy purchased by a male annuitant with $100,000. Payout amounts for female applicants, who have longer life expectancies, may be lower. Payouts are subject to change and exclude premium state taxes. Income is payable monthly for the life of the annuitant. If the annuitant dies before receiving payouts that total the premium amount the beneficiary will, receive in monthly installments, the difference between the premium paid for the policy and the total payments made to the annuitant. Payout rates will vary for the other income plans and other premiums. Insurance companies offer a wide selection of payment options to best suit everyone’s individual income planning needs. It is important to know that some companies offer more options than others, and your annuity income payment will be different from one insurance company to the other, depending on their company rating. Ask your Financial Expert for an illustration in order to better understand and learn your income payment options. Most commonly offered payment options are described below. Payments are made for the life of the recipient. Payments cease upon death of the recipient. Payments are made to the recipient for the amount of time selected at purchase. Once the recipient has received the selected number of payments, all payments will cease. If the recipient dies prior to receiving the total number of payments selected, the beneficiary will receive the remainder of those payments. Payments are made for the life of the recipient. If the recipient dies prior to receiving the total number of guaranteed payments (selected at time of purchase), the beneficiary will receive the remainder of those guaranteed payments. Life with Installment Refund: Payments are made for the life of the recipient. Upon death of the recipient, if the sum of the payments received is less than the premium paid to purchase the Annuity, the Annuity continues paying income to the beneficiary until the total payments received is equal to the premium paid to purchase the Annuity. Payments are made for the life of the recipient. Upon death of the recipient, if the sum of the payments received is less than the premium paid to purchase the Annuity, the difference is paid out as a lump sum to the beneficiary. Payments are made for the life of a primary recipient. If upon death of the primary recipient the surviving spouse or partner is living, that person will receive a continuation of payments equal to a percentage (selected at time of purchase, up to 100%) of the original income amount. Payments cease upon death of the second person. Payments are made for the life of a primary recipient. If upon death of the primary recipient the surviving spouse or partner is living, that person will receive a continuation of payments equal to a percentage (selected at time of purchase, up to 100%) of the original income amount. If both the primary recipient and secondary recipient die before the total number of guaranteed payments are made, these payments will be continued to the beneficiary, ceasing at the end of the guarantee period. Payments are made for the life of a primary recipient. If upon death of the primary recipient the surviving spouse or partner is living, that person will receive a continuation of payments equal to a percentage (selected at time of purchase, up to 100%) of the original income amount. Upon death of the second recipient, if the sum of the payments received is less than the premium paid to purchase the Annuity, the Annuity continues paying income to the beneficiary until the total payments received is equal to the premium paid to purchase the Annuity. Payments are made for the life of a primary recipient. If upon death of the primary recipient the surviving spouse or partner is living, that person will receive a continuation of payments equal to a percentage (selected at time of purchase, up to 100%) of the original income amount. Upon death of the second recipient, if the sum of the payments received is less than the premium paid to purchase the Annuity, the difference is paid out as a lump sum death benefit to the beneficiary. Many insurance companies are now offering a Cost of Living Adjustment or Income Linked to Inflation option in order to help protect purchasing power in the case of possible future inflation or expected increases in spending habits. When this feature is selected and the initial income payment is determined, income payments will increase annually by a specified percentage each year. The payment amount usually increases between 1% and 5%, which may be more or less than the actual rate of inflation. Selecting the COLA benefit may result in lower income payments in the early contract years compared to the same payment option without such a benefit. However, the later contract years of the Annuity with the COLA benefit will reflect an increase in payments over and above the same Annuity without the COLA benefit. When this feature is selected and the initial income payment is determined, future income payments will be adjusted based on changes in the Consumer Price Index-Urban (CPIU). The CPIU measures changes in the prices paid by urban consumers for a representative basket of goods and services. If the CPI increases, you may receive more income. When the CPI decreases, during deflationary periods, this may result in lower income payments from the Annuity. Selecting an Annuity linked to inflation may result in lower income payments in the early contract years compared to the same payment option without such a benefit. Traditionally, retirees have relied on pension plans and Social Security for retirement income. However, individuals are becoming increasingly responsible for creating retirement income from their own personal savings. As part of a diversified income plan, deferred income annuities can provide you, or you and your spouse, with guaranteed* income for the rest of your life, starting at a date that you select in the future. Avoid outliving your assets by ensuring that you will receive a guaranteed stream of income for life, beginning on a date in the future that you choose, generally 13 months to 40 years from your time of purchase. When you invest in a deferred income annuity, you may choose to receive guaranteed income for your lifetime (or for the lives of you and another person for joint accounts). In addition, you have the choice to purchase optional features to include protection for your beneficiaries or add an annual payment increase feature to help your investment keep pace with inflation. Keep in mind that deferred income annuity contracts are irrevocable, have no cash surrender value, and no withdrawals are permitted prior to the income start date. A deferred income annuity is also eligible to be a Qualified Longevity Annuity Contract (QLAC), which allows you to take a portion of your pre-tax assets and start the lifetime income after the minimum required distribution (MRD) age of 70½ and up until age 85. Planning for income for the later years of retirement may help you address expenses that tend to rise with age such as health care costs. Having confidence in receiving predictable income payments may be just as important to pre-retirees as it is to retirees. Deferred income annuities provide you with the security of steady payments, regardless of market fluctuations and downturns, starting at a date you select in the future. incorporate into your diversified income plan. In exchange for a lump-sum investment, deferred income annuities provide guaranteed lifetime income beginning up to 40 years from your first premium payment. 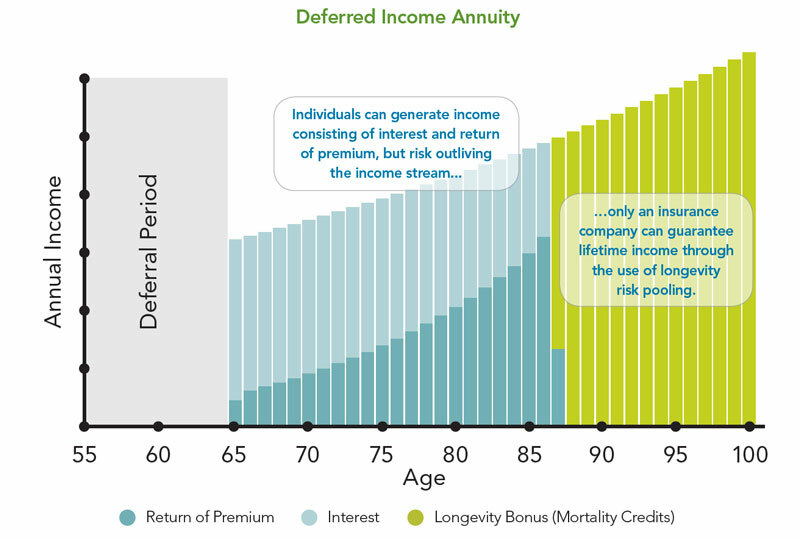 What separates annuities from other investment options is the benefit of longevity risk pooling (or mortality credits). Effectively, assets from annuitants with shorter life spans remain in “the mortality pool” to support the payouts collected by those annuitants with longer life spans. Put simply, the longer you live, the more money you will receive. This is why it is so challenging for any individual investor to replicate this income stream to last a lifetime. 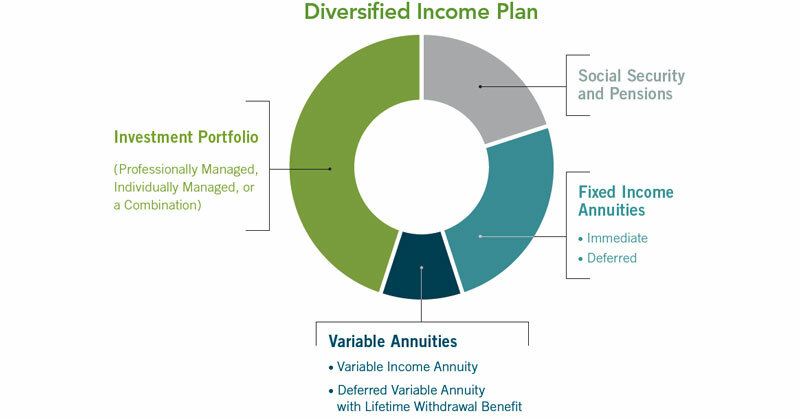 How does a Deferred Income Annuity fit into a diversified income plan? Putting yourself in a position to create future income is an important step in your transition to retirement. We believe every investor should have a plan that combines multiple sources of income to create a retirement income stream to help meet their needs. Deferred income annuities can help provide a predictable stream of lifetime income, regardless of market fluctuation, which may help you become more comfortable in maintaining your strategy for your other investments. Below is a hypothetical example of a 55-year-old woman who is looking to retire in ten years at age 65 and wants to start planning to cover her essential expenses with guaranteed income throughout retirement regardless of market conditions. She has $850,000 in available assets and will be collecting guaranteed payments from Social Security. She takes her first step in building a diversified income plan by purchasing a deferred income annuity, which secures additional guaranteed income beginning in ten years. This will better position her to cover essential expenses in retirement.